JD and I decided to hit a beach. The wind had been blowing for a couple of weeks pretty hard and it was still blowing pretty good. We managed to pick up a couple of Kingfish Carcasses from a local marina and we had brought some Cudas with us from our freezers.
" I was starting to dose off when JD screams. I look up and I hear my 14/0 with a Big Cuda Head going out. " We put out 4 baits on this beach. After a few hours we finally get a hit. It’s my 12/0 packed with 125Lb Bullbuster Mono with a Fresh King Carcass that gets picked up. This Shark is playing with the bait. Finally I see the line take off. This Shark is taking line very slowly. Finally I decide I’m going to hit em and I hit the running man. As soon as I get tight JD says he heard him jump so we think it’s a Blacktip. "This shark makes a couple of nice dashes towards the beach and also heads back out a couple of times. " 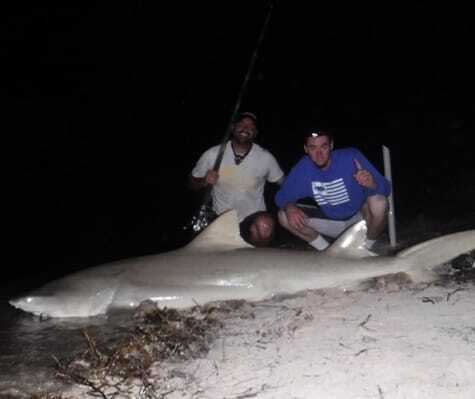 After a short fight I bring in Lemon Shark that is about 6 1/2ft. We are happy though as the conditions on this night are not favorable. This shark swims off easily. Several hours later I was starting to dose off when JD screams. I look up and I hear my 14/0 with a Big Cuda Head going out. I pick up my 14/0 that is packed with 200LB Bullbuster Mono. The shark picks the bait back up and starts going out steady. I set up and I’m on. This Shark makes a couple of nice dashes towards the beach and also heads back out a couple of times. We are not sure what its is just yet but as it approaches it’s a Big Lemon Shark. We quickly cut the hook and JD puts the camera on self timer so we can take a pic. We take a couple of pics and then release the Shark. I walk the Lemon out a little ways and she kicks hard and heads for the deep water. A short while later we wrap it up. All in all a good trip with 2 Sharks landed and released including a very Solid Lemon Lemon Shark .